The shape, colour and intelligent design of this monocular are directly evocative of the legendary MINOX spy cameras. And it again embodies the qualities that made MINOX famous: ultra compact dimension, first-class workmanship and convenient operation. The robust metal body houses brilliant optics offering a superb imaging performance. For example, at 6x magnification and a close focus range of 1,5 m, butterflies can be observed exactly in their immediate surroundings. However, the MINOX MD 6x16 is also useful for viewing distant objects. 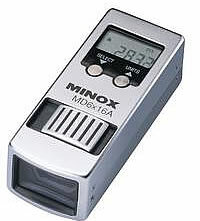 Even fast-moving objects will not escape the unusually large field of view of 140 m. Equipped with a neck strap and a practical case, the MINOX MD 6x16 is the ideal companion for all those who appreciate lightweight equipment but do not want to miss any of the action. Thanks to the easy one-hand operation, the telescope can be used for almost any occasion - at sports events, on vacation, at the opera and the theatre. The shape, colour and intelligent design of this monocular are directly evocative of the legendary MINOX spy cameras. And it again embodies the qualities that made MINOX famous: ultra compact dimension, first-class workmanship and convenient operation. The robust metal body houses brilliant optics offering a superb imaging performance. For example, at 8x magnification and a close focus range of 1,5 m, butterflies can be observed exactly in their immediate surroundings. 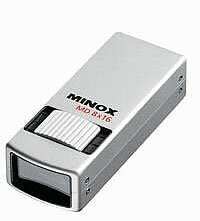 However, the MINOX MD 8x16 is also useful for viewing distant objects. Even fast-moving objects will not escape the unusually large field of view of 140 m. Equipped with a neck strap and a practical case, the MINOX MD 8x16 is the ideal companion for all those who appreciate lightweight equipment but do not want to miss any of the action. Thanks to the easy one-hand operation, the telescope can be used for almost any occasion - at sports events, on vacation, at the opera and the theatre.